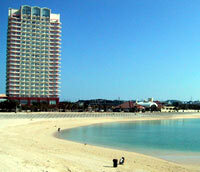 One of Chatan Town’s largest public parks, Chatan Park is filled with sports facilities, a spa, barbeque pavilions and a beach. Located adjacent to American Village, Chatan Park covers more than 51 acres (20.8 hectares) with its Athletic Park with baseball and softball fields, track and field facilities, tennis courts, an indoor athletic field, swimming pools and a spa. The park has Sunset Beach on its western boundary. 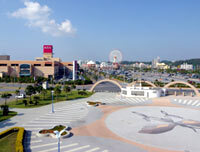 With exception of the baseball and softball fields, which are not free and also require reservations, Chatan Park is available daily to all citizens. 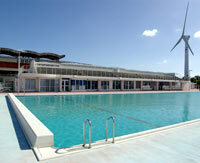 Beach barbeque pavilions may be rented, along with marine equipment, beach balls, etc. Reservations for barbeque units and sports equipment may be made at 936-8273. Spa reservations may be made at 926-2611. Additional information is available online at http://www.chula-u.com. Chatan Park has plenty of parking throughout its acreage. Near the park are Mihama American Village, the Beach Tower Hotel, JUSCO, the SevenPlex, a home improvement store and a number of restaurants and clubs.